Four delightful little Flatback Sea Turtle hatchlings, who are barely larger than the size of your hand, now call SEA LIFE Melbourne home and are ready to share their big new adventures with you. These little hatchlings are part of a larger conservation project, helping to protect the only species of turtle that is native to Australia. Although these little shelled marine friends call SEA LIFE Melbourne home for now, in years to come, they will be fitted with miniature solar powered satellite tags and will be released back into the wild. 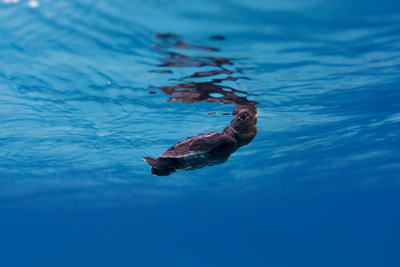 Monitoring SEA LIFE Melbourne's four Flatback Sea Turtles in the future will help understand the journey and behaviours of these graceful sea creatures, helping scientists understand more about Australia's vulnerable species of marine life. The winter school holiday program will also incorporate an “Animal Planet Ranger” activity. Children are encouraged to visit SEA LIFE Melbourne's marine creatures and go on a mission to collect Animal Planet Ranger Cards along the way. With plenty of interactive animal displays, magical marine stories, expert keeper presentations and new baby turtles to see, SEA LIFE Melbourne will take you on an unforgettable voyage in the July school holidays. When: Monday to Sunday 9:30am - 6pm.